I hadn't really tried yet. Well, logged in there, got frustrated with their interface again, and sorta forgot about it, I'm afraid. 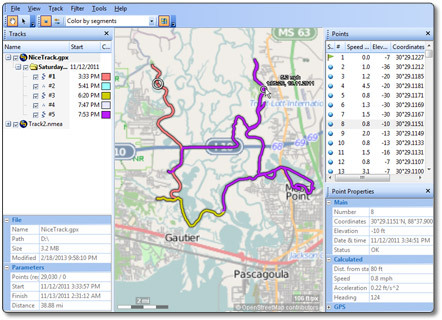 GPS Track Editor is a Windows application for editing GPS tracks. GPS track is an ordered sequence of points with latitude, longitude, date, time, and maybe some other parameters. Unfortunately coordinates obtained from a receiver are not precise. GPS errors are affected by a number of reasons that cannot be eliminated. For example the receiver can show some movement while standing still. GPS Track Editor can help you to clean up your tracks. Some deviations are processed automatically but you can always control the result and edit a part of the track manually. Display the trajectory of your movement. Track point filter by parameter limitation. Adjust track structure, rename segments. work with fragments of a track or a set of tracks. Merge or combine several tracks into one. Wow! Try it. I just ran it against that Indian Point track I posted a graphic of earlier. All I did was tell it to to filter "Local Inconsistencies" and it nailed most of the spots where I'd stopped but my GPS hadn't. Only downside was, it also mistook a couple of switchbacks as such problems. But the upside to that downside is, you can easily pan around the track and A) see what it's filtered, and B) "restore" filtered points it shouldn't have. This is really easy to do, as the ones you want to restore are few and far between. At least on the first track I tried. This seems to be exactly the tool we were all hoping to find! And it's free, too, as best I can tell. I think the program is freeware, but not certain. Its good to hear a wow recommendation on this as I have not had time to play with it yet. My only problem is its windows based and I run Linux. The program opens with Wine (Linux compatibility program) but did not run so well, my only other option is to run it inside a virtual machine which will work but is slow. I know, my own undoing... Linux rocks. So anyways, I'll make certain I add it to my list with a thumbs up but feel free to let us know its ins and outs. Definitely a Winders critter, yeah. And it doesn't do a whole lot, but what it does is done exceptionally well, it seems! (Caveat: I've only played with it for 5-10 minutes!) What I really like is something I haven't seen in any other editor - it has a "transactional" model for editing. That is, you filter points by whatever criteria, add and remove points to the filter, and finally "commit" the edits. Or cast them aside. Very slick. Seems it'd be pretty easy to overwrite an existing track, so you'll want to be sure to do a SaveAs if you want to keep the original intact. Looks like it'll do a few other "odd jobs" I've wanted to find a way to accomplish. Next thing I'll try is combining a bunch of tracks from the same area(s). Could be a really nice way to consolidate a lot of info. Initial impression, yeah, it's definitely worth becoming familiar with, and knowing when to use. here is another freeware windows only program I used a lot when I used windows. http://www.easygps.com/. The freeware does not edit much, but its a fast easy interface with the device. The pro version though says "Unlimited topo maps and aerial photos! View your GPS data in Google Earth", that might have potential for the GIS users. I had tried GPSTrackEditor earlier, but I guess I hadn't given it a fair shake. It looked too much like other tools I had and I didn't think I needed yet another track editor. I think that "filter local inconsistencies" looks like it has a lot of potential, and you are correct, restoring points removed in error is really easy. Thank you for posting this. I think I will have to use this on some of my upcoming tracks to see how it works with them. It will be much easier for me to experiment with a fresh track than one I did a long time ago. On my old computer, I had installed the TerraGo Toolbar as an add-on for Adobe reader. This program would allow me to measure my hikes on topographic maps which were in pdf format. I did a hike (a very wet hike) on Memorial day, and used GPS Track Editor to clean up the tracks - between the filter local inconsistencies and filter by value (using 5mph), it did a great job of cleaning up the track. Had a couple spots where we stayed put for a while, and got the "spider on acid" track - it cleaned those up very nicely. I don't think it really removed any points in error, although there weren't any switchbacks on this hike.